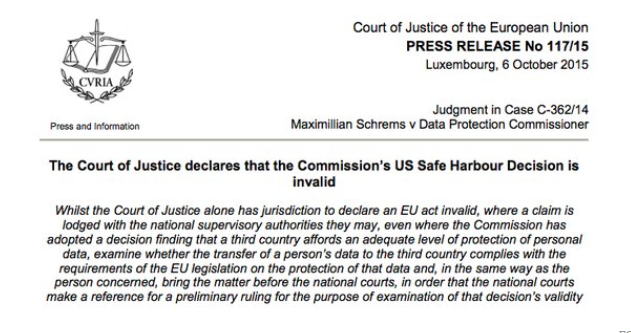 In 2015, the US Safe Harbor scheme was deemed invalid by the European courts. As a result of this finding, the processing of personal data in the United States e.g. on websites such as SurveyMonkey, Classdojo and Edmodo has likely been in contravention of Principle 8 of the Data Protection Act. Advice from the ICO thus far has been to “watch this space” rather than remove all data from the US, as it was likely a new compliance scheme, between the EU and US, would have to come into effect. The new US Privacy Shield scheme has now been approved by the EU as a replacement to Safe Harbor. Privacy Shield is another voluntary self-certification scheme where US companies can elect to comply with EU equivalent privacy rules in order to transfer personal data between the EU and US. The US Department of Commerce has been tasked with reviewing self-certifications to ensure compliance and is to maintain a website of US companies which comply with the scheme. Going forward, if the Council is to store any personal data in a US-based system, it is important from a Principle 8 compliance perspective that a check is undertaken to ensure the company is Privacy Shield accredited. For any Council personal data already stored in the United States e.g. on SurveyMonkey, ClassDojo and Edmodo, it is important that we review the forthcoming list of accredited companies to ensure these companies end up on the list. If after a number of months we find that these companies are not self-certifying against Privacy Shield, we may need to consider removing Council personal data from these companies. However, we all have a legal responsibility to ensure we adhere to the principles of the Data Protection Act. But, to be properly informed, the data subject would need to be told that their data was going to a country where the authorities’ wide ranging powers of interference and surveillance and the absence of any administrative or judicial means of redress, compromise individuals’ fundamental rights to respect for private life and to effective judicial protection. And considering the Court of European Justice ruling has questioned the data protection and security regime of the United States, then no contractual agreement will satisfy the EU data protection requirements. At time of writing Safe Harbor 2.0 (If this is what it is to be called) currently being drawn up by the EU and US authorities, is already being questioned. Google Apps for Education and other Software providers have offered Model Contract Clauses (MCCs) as an alternative compliance option to Safe Harbor for a number of years. These clauses are not directly affected by the European Court’s decision and can be used by customers as an alternative means to legitimise the transfer of data. In the specific case of Edmodo, Safe Harbor allowed its use , but with qualifying conditions. To agree to using Edmodo, ALL of your learners would have had to have parental agreement as detailed below , and you will have kept a signed agreement , renewed annually for every pupil using the service. With the demise of the Safe Harbor agreement, I would take a serious look at the terms and conditions, knowing that personal data is being stored outside the EEA, and look to other services such as GLOW to share data with learners and other professionals. If you are in any doubt , please contact the Information Security Officer at Aberdeenshire Council who will offer more detailed advice.